One of my goals over the next 24 months is to find a larger house for my family of three. Our house is currently about 1,920 square feet with three bedrooms, two bathrooms, and a nursery. We built a 260 square foot deck off the master and have a small play area in our backyard. After our house was battle-tested six times with relatives visiting since the birth of our son, we’ve decided it would be nice to have one more bathroom and 300 – 500 square feet of extra living space. As a writer, I need a quiet place to hide and think. It’s important I separate where I write and where I sleep. Besides, with a little Pavarotti in the making, our house is getting smaller by the month. Boy does my boy love to sing and talk. Since purchasing our home in 2014, our income and net worth have luckily increased. We currently spend roughly 5% of our monthly gross income on all housing costs. Based on my housing expense guideline for financial freedom, we want to maintain our monthly house expenses at no more than 10% of our gross income. Therefore, we feel it’s OK to purchase a house up to twice as expensive as our existing home. For those of you who plan to buy a house in the near future, be it a first-time home or an upgrade, let me suggest a framework for how to invest your down payment or full payment while searching for your new home. The main variables in your down payment or full payment investment decision are: time, return, risk, existing cash, and cash flow. The closer you are to buying a house the less risk you should take. The lower your risk tolerance, the lower risk you should take. The better your investing acumen, the more risk you are able to take. The higher your existing cash balance (down payment or full payment), the more risk you can take. The higher your cash flow, the more risk you can take. The higher the mortgage interest rate, the bigger the down payment you should make. The higher you expect mortgage rates to go, the pickier you should be. The more bullish you are about your financial future, the more leverage you may take. Investments should be made in investments that can become liquid by the time you want to purchase. Everybody is at a different financial stage of their lives. Therefore, the one absolute variable we should focus on is the timing of your house purchase. I’m also going to assume that everyone has at least a 20% down payment plus a 5% – 10% cash buffer after the down payment. If you do not have between 25% – 30% of the value of the house in cash, you cannot comfortably afford the house. One of the main reasons why there was a housing crisis in 2008-2010 was because too many Americans put down 3% or less and didn’t have sufficient cash left over to pay their mortgage once they got their pay cut or lost their jobs. Please don’t put your financial future at risk while also jeopardizing your neighbor’s financial future as well. Think of others. Back then, many homeowners took out negative amortizing loans with no income verification and no down payments to be able to “afford” their homes. If they had had a 5% – 10% cash cushion after putting down 20%, I’m certain the vast majority of homeowners who defaulted would have been able to keep up with their obligations. Further, if they had taken out adjustable rate mortgages, they would have found mortgage relief as their rates adjusted lower. Please, if you do not have between 25% – 30% of the value of the house in cash before purchase, getting to at least 25% – 30% should be your #1 priority. Work longer. Save more. Ask the Bank of Mom & Dad for a gift like so many adults do in big cities nowadays. There once was a time when the majority of Americans purchased property with 100% cash. Now that we’ve agreed on the down payment and cash buffer, let’s look at the main assumption: The closer you are to buying a house the less risk you should take. You should carve out an investment portfolio specifically for your house purchase. Let’s call it your House Fund. Your House Fund is a separate after-tax portfolio from your pre-tax retirement funds like your 401(k), IRA, SEP IRA, Roth 401(k), 403(b), and so forth. Compartmentalizing your investments for different purposes helps with motivation and risk-appropriate investing. For example, you might be inclined to take more risk with your 401(k) since you won’t be able to tap it for 30 years. The same type of risk is probably inappropriate for your House Fund if the down payment is due next week. Let’s say you’re just starting on your House Fund journey. You’re in your 20s and not quite sure where you want to live because you’re not quite sure what you want to do with your life. You know you’ll eventually want to settle down, but not until you find a stable career. Five years away or longer sounds about right because you also need time to accumulate your 20% down payment plus 5% cash buffer. You take the median price of the homes you’d like to buy, multiply it by 25% to come up with your minimum House Fund goal. So much can happen in five years that it’s impossible to know the future. You might not even want to buy a house five years later. Therefore, you should invest your House Fund as you would your retirement accounts based on your age or work experience. Recessions generally don’t last longer than 18 months. Therefore, if your time horizon is truly five years or longer, you have time to make up for your losses through savings and investment returns. You should always have 6-12 months of cash in a separate account by the way. You’re pretty certain that you plan to buy a house within the next 2-5 years. You’ve found a stable job, a nice city, and maybe even a love interest to settle down with. You’re excited about a future that is slowly getting clearer! You’re now much more focused on ensuring your down payment is always increasing. Therefore, it’s only logical to dial back some risk. At the same time, you might also be in the high growth phase of your career. Your income and savings have a tremendous ability to buffer investment losses in your House Fund. You can adjust your House Fund investment allocation according to your financial health and your purchase time horizon. 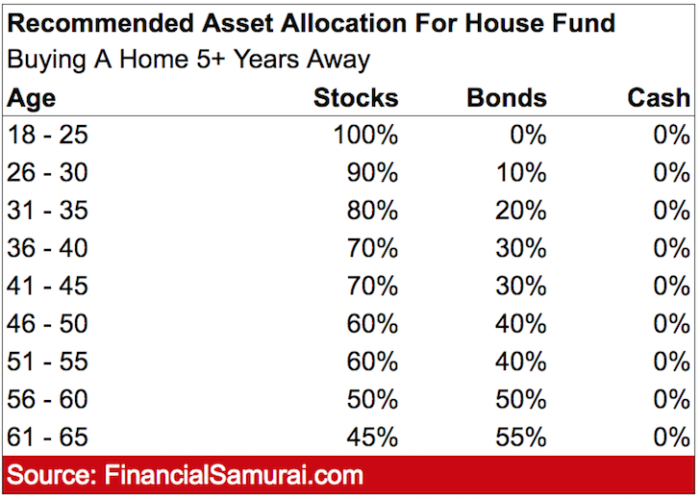 If you’re bullish on your financial future and don’t plan to buy a house until year 4 or 5, then you can probably take maximum risk by going 100% in stocks. On the other hand, if you work in an occupation with 0% – 3% annual wage growth in an industry facing structural declines, you may want to consider a maximum 50% stock allocation while boosting your cash allocation. If you’re planning on buying a house with the next 24 months, it’s crunch time. You do not want to expose your down payment to potential market losses. Even if you think you’re still two years away from purchasing, because you’re so focused on buying a house, there’s a good chance you might buy one much earlier. For those of you who have a high risk tolerance and who have very strong cash flow, I suggest limiting your House Fund stock exposure to no more than 25%. This way, even if your 25% goes down by 30% in a bear market, the most your House Fund will lose is 7.5%. But given you should earn roughly 2.5% from the remaining 75%, your House Fund won’t lose more than 6% in such a bear market scenario. The positive of a bear market in stocks is that the house you’re looking to buy will almost certainly decline in value as well. If the house is declining in value greater than your House Fund is declining in value, you’re winning. Your bond allocation should be completely in short-term Treasury bonds, e.g., 3-month is likely best. Because it usually takes 30-60 days to close on a house on average, you don’t want to tie up your money in longer-dated Treasury bonds. You can always sell before expiration, but by doing so you risk potential principal loss. With money market accounts yielding a healthy 2% or higher nowadays, I see no problem having 100% of your House Fund in cash for maximum flexibility and security. Knowing that you will increase the value of your house down payment or full payment by at least 2% with zero risk is wonderful. Buying a house can be a very emotional experience. There will be times when you put in your best offer and it’s simply not good enough due to price, down payment size, timing, a cold offer letter, or some other unknown reason. 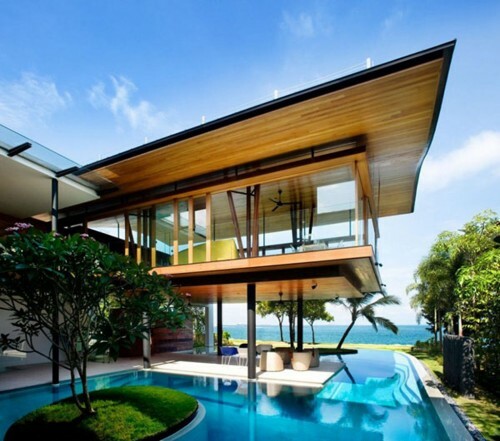 Chances are high that if you find your dream house, other people will like it too. Therefore, it’s wise to make your down payment as strong as possible. You’ll already be stressed during the house purchase. You don’t want to add to your stress by worrying about whether your down payment is sufficiently attractive to the seller. If you’ve never owned your primary residence, you’re in for a treat once you finally do. When you get your keys, you will experience a priceless feeling that nobody really talks about. It’s an amazing feeling to own an asset that not only has the potential to go up in value, but also provides utility every day. I truly believe for most people, owning real estate is one of the easiest ways to build long term wealth in a satisfying manner. You will never be able to enjoy your stocks or your savings. But with real estate, you’ll be able to create wonderful experiences. After my House Fund appreciated by ~5% this year, I’ve significantly de-risked and now hold roughly 75% of the fund in cash. The cash is earning 2.4% in 3-month Treasuries and 2.45% in an online savings account. I’m not willing to buy longer-dated Treasuries because the yield premium is not much higher (2.5% for 6-month Treasuries, 2.6% for 12-month treasuries etc). Further, I believe there’s a 55% chance I will buy another house within the next six months. Because I see the Honolulu and San Francisco property market cooling off all year, I’m submitting under-asking offers on properties that have been sitting for over 30 days. One property in Honolulu has been sitting for three years! My goal is to put 50% – 100% down. If I end up not buying a house this year, then my House Fund will likely end the year up 4% – 12%, depending on how the 25% position in tech-heavy stocks performs. I’m OK with forgoing upside gains because if I don’t buy a house in 2019, the chances of me buying a new house in 2020 go up. The closer you get to buying your property, the less risk you should take. Stocks have an uncanny way of slowly going up during a bull market, and collapsing suddenly during a market panic. I hope this post gives you a good framework on how to invest your down payment. Owning a wonderful home that you can afford is truly one of the biggest wins of your financial life. Explore real estate crowdfunding: If you’re looking to buy property as an investment or reinvest your house sale proceeds, take a look at Fundrise, one of the largest real estate crowdfunding platforms today. Fundrise allows you to invest in mid-market commercial real estate deals across the country that were once only available to institutions or super high net worth individuals. Instead of taking a large concentrated bet in a single property, you can diversify across multiple properties with as little as a $1,000 investment each. Sam I am very glad that I found your website. It’s very informative and unbiased. I am hoping you can assist me. I am a freshly divorced female, 62 years old, and I plan to work for 15+ more years. I plan to move to Las Vegas by August 2019. I qualify for a one day out of foreclosure non conventional mortgage and plan to put 15% as a down payment. I am employable so no worries regarding employment to qualify or keep up with my payments. My question is there has been an increase in home values in the LV area due to the ever expanding home building, sports, etc making it a feeding frenzy for bloated real estate brokers. There is plenty of inventory but the home prices have finally steadied at 5% increase due to a flurry of buyers from California, primarily retirees, who can easily pay cash for a home at an inflated price due to their looking at the home price as cheap compared to CA. I’m hearing and reading conflicting reports regarding the bubble in Las Vegas. I lost all of my real estate investments in 2007 and survived a crummy marriage and I cannot afford to take another risk. However, I do want to purchase a SF home sooner than later. All the data coming out on prices, inventory, time on market. Is there any way to get the raw data to analyze it ? Where do you get/look at this data ? I read an interesting article in the Wall St Journal this week in an article about how most people typically have financial inertia and end up keeping their keep cash balances in lower yielding options by default even when there’s risk free options that pay a couple percent. It described a new fintech company, MaxMyInterest, that optimizes sweeping cash from your checking to the highest yield savings accounts. It seemed like a helpful approach in line with your philosophy of automating financial behaviors. Wondered what your thoughts were on that service or other ways to automate investing and cash management. A lot of people I know usually aim for at least a 10% deposit with their house, so it’s eye opening to read the 25% – 30% but it definitely does make sense. I think it’s important not to think like most people. Because if you look at the stats, most people aren’t doing well financially. Let’s strive to be better! I have not read your blog in a while, still such great content! I was surprised you had a baby, I guess it has been that long. I am thinking about a bigger home to build a back house and hopefully have my in laws live there, due to health issues. This article was just what I needed to review my goals. 3 month treasury bonds are at 2.41% and state tax free. Mix and match. Depends on your timing. At this point in the cycle how much under asking are you trying to go to be interested in a property? For the Hawaii house that has been sitting for three years, I’m offering 25% below asking. It’s kind of insulting, but then again, listing your house for over three years obviously means the house is overpriced. With San Francisco, 5% under asking that seem OK, since prices have faded since the 1Q2018. So I guess you’re still bullish on SF real estate? If you’re only bidding 5% under asking, that suggests you don’t see much further downside. There have been some interesting discussions on the local real estate blog SocketSite (link in name) on double-digit percentage price drops in San Francisco over the past few years. A lot of prices here are purposefully set low too. But it’s a case by case situation. If prices are down 5%, and pricing is set 2% – 5% below market, and I offer 5% below pricing, we’re talking -12% to -15%, which is what I think is a reasonable price correction before the IPO onslaught. SocketSite has been bearish since it started 14+ years ago. The founder, was frustrated after his Dartmouth undegrad and Wharton MBA that he couldn’t afford a place, hence the site. Unfortunately, as we all know, SF real estate took off huge, so SS lost a lot of credibility. It just focuses on the negatives. It could have grown so much more if it had balanced coverage. Alas, the founder’s frustration go the best of him. What’s your outlook for the SF RE market and why? Personally neutral on SF RE, if for no other reason than that we are still close to all time price highs, and reversion to the mean is as close to a law of nature as death and taxes. Other negatives include the new SALT cap, which effectively means that property taxes are no longer deductible for anyone with a reasonably high income. Also the mortgage interest deduction is down to $750k, which doesn’t go far in SF. Personally I’ll be very interested to see what happens to the local RE market after people file taxes this spring; my impression is that a lot of folks aren’t aware of how the changes will affect them. Hi! I’m looking to buy my first home in San Francisco in 2019 so this article is very timely. I’ve been wanting to buy for a while but keep chickening out. Sam, in previous posts you mention that real estate in SF is at an all time high and it’s not super smart to be buying now. If I’m misquoting, my apologies. I’m pleasantly surprised to hear that you’ve got confidence in SF’s real estate market. But did I miss something? Thanks. Sure, prices are down from 2018 and I want a bigger house for my family. I’m making below asking offers. True that the home maybe overpriced. Sometime there’s something wrong with the home or the land (movement), not desirable neighbors. Thanks Sam for this post!! We have been looking for a home in the Bay Area for close to two years now and plan to put a big down payment(close to 50%) once we find one that we really like. Most of our money for our down payment are currently in high-yield savings account so it can be immediately liquid. And with the housing market over here cooling off a bit, now’s our chance to purchase one. Let’s hope we find one that we really like. I think you will! Inventory is up at least 30% year-over-year and I think you’re fine a lot more opportunity this year for sure. Good luck! Great post as this is timely for me. It’s almost like getting a second opinion as I am thinking about buying this year, but being extremely picky given market conditions. I’m not trying to time a bottom, but at the same time, I don’t want to over leverage myself. Great insights on this one. Indeed. I try to anticipate as much as possible, but it’s hard to know exactly what I want or how things will play out in the future. Our old house of about 2300 ft.² it would probably be just right, because it does have an extra level where one can escape to. But the location was on a busy street next to the busiest street in San Francisco. Therefore, I didn’t feel quite at ease with a little one. We’ve managed to raise a little boy for two years so far in this house, so that works. And one more year would be fine too if needed. But now we have an excess of funds, and our plan is to always keep optimizing our life. Why not. Currently I am considering the 2-5yr route with medium risk(1/3 each) for a down payment. BUT i am curious how aggressive i should be in saving. I have read your post about recommended saving by income but i live in a LCOL area and i am thinking of moving somewhere more expensive for higher income. How would i plan for this? I have no idea without knowing your financials. In The Netherlands, it is very common to finance 100% of the property. Only requiring payment of fees etc. Not too long ago anyone could finance about 110% of a property. I too, took advantage of that but I worked in an industry where salary increases of 15-20% per year a common. With the real estate market sky rocketing in Amsterdam etc. every buyer is highly leveraged. This caused me to stay put and pay off my mortgage making use of all the convenient tax free possibilities that The Netherlands offers… Being highly leverage on your own house, providing only utility but no cashflow will set you up for disaster.. Good luck with your search for an upgrade!! Ah, love Amsterdam. It is like the San Francisco of Europe in a city that I would love to live in for six months or year. What is causing the prices to do so well there? What can you get for million US dollars? Yes, Amsterdam is great. But a lot of Dutch people and expats think so as well :) Housing inventory is very, very low in and around Amsterdam. Together with the influx of expats, Brexit and the low interest rate environment, prices have increased significantly. Friends who bought a relatively small apartment in a nice part of Amsterdam for USD 250.000 3 years ago, could now sell it for almost double. For let’s say EUR 1.000.000 so about USD 1.100.000 you could buy a nice ‘Grachtenpand’, a 2 bedroom apartment, next to the canals in the center of Amsterdam. Built in 1904, fully renovated and up to standard. For anyone who’s living in a high-tax state and having trouble saving for their downpayment, one tip for “supercharging” your ability to save for a downpayment is max. out your 401k and then, when you’re ready to go into contract, take a $50k loan from your plan for purchase of a primary residence. You’ll need at least $100k since you can only borrow up to 50% of your balance. If your employer’s plan is a good one, they’ll even give you the option to pay back the money over 30 years (in case that’s helpful). This strategy helps you pay for your downpayment with pre-tax dollars. It does subject you to market risk since the loan proceeds are funding by selling 401k assets. Nonetheless, it is a strategy I found helpful while living in high-tax NYC struggling to save up for my first apartment. Great article as we were just in this dilemma. We sold a free and clear rental, and are looking for other investments/upgrading our house. We went ahead and paid down our mortgage to 175k (house value of 875), and turned around and opened up a HELOC for 500k. By doing so, we immediately get a 4% return ROI due to the fact we are on a 10/1 Interest only. We are saving net 1300 a month in interest, which with the SALT caps and new higher standard deduction will have little to no impact on our taxes. We decided since there is no time table on the perfect buying opportunity, paying down the house and getting the 4% immediate return was the best option. Also there is something to be said about being 2-2.5 years away from owning our house free and clear by 35. Could you please explain how are you getting 4% ROI? Mortgage is 4%, on a 10/1 interest only ARM. Paid down 400k on our mortgage, which lowered our monthly payment immediately $1333/mo. Previously if we paid 3k, aprox $1100 would go to principal, and $1900 to interest. If we pay 3k per month now, $600 will go to interest and $2400 to principal. Yes, we did have the cash in a high yield savings at 2.4%, so the difference is only 1.6%, however by paying down the mortgage, we can take advantage of 401k & deferred compensation plans at work for tax benefits. Also, we were paying tax on the interest earnings, $1333/Mo is a big difference on a net cash flow basis. We live in California and with the new SALT caps, we loose a big chunk of write offs. For the first time, less debt and taking the standard deduction for a married couple actually looks like the way to go. The benefit of a HELOC is we still have the funds accessible as an open check book if necessary. Due to our 20% LTV prior to the HELOC, even if values come down, we will still have a lot of equity to tap if desired. With rates being low, if we do use the money we can always refinance into another ARM or fixed rate if necessary. Gives us flexibility. One big benefit of the ARM I/O is the immediate return if you pay the principal down, it’s immediate return. Which banks offer a interest only loan? Buying a house is a big deal! They don’t come with return policies. :) smart list of tips for what to do with the money allocated for a down payment. With something as important and momentous as buying a house protecting all that money you’ve worked so hard to earn makes so much sense. If there ever was a post you’ve written which speaks directly to me, it’d be this one. Kudos to pulling this together. I’m very happy to hear your thoughts on the matter and see they more-or-less coincide with our current actions for buying a house in the coming 2 years. Our asset allocation is roughly in line with your 75/25 split and we hope to transition this closer to 90/10 as the year progresses and eventually to 100 cash/Treasuries. This housing fund will hopefully account for a 25-30% down payment amount when we do decide to begin making offers on homes. The 5-10% cash buffer you suggest on top of the home down payment is a minimum for us as well. Given our intended timing, places where we are in our careers, and savings rate, I feel fairly certain knowing we can accomplish all of these goals. Sounds like you’ve got a good plan! Well done. Buying a house in a year or so could be pretty good timing as inventory ramps up right now. It’s more than just numbers, so here’s a question. What is the probability that you and your wife are psychologically prepared to give up your Mainland abode and move permanently to an Outpost in the Pacific? High. We love to live in both cities and will have two homes. It’s the benefit of owning a relatively inexpensive home in SF. The ideal scenario is Honolulu-SF-Lake Tahoe given we are free to travel. Travel op[tions decline quickly as your Tenor nears preschool. Home school? We figure 3 months during the summer and one month during the winter is more than enough travel time for us. I don’t really like traveling for more than two months a year. Hmmmm -Four months traveling — Interesting idea, which does not seem to completely align with my most recent preschool experiences. You would accumulate a lot of frequent flier miles – that’s good. We home school three young kids largely for travel and life flexibility. We spent one summer (months) going from town to town in Western Colorado. The kids still remember it. We also visited the West Coast (Portland to LA), Wyoming, and Montana. It can be done and enjoyed, but it does have ups and downs. re: The ideal scenario is Honolulu-SF-Lake Tahoe given we are free to travel. Sounds like a wonderful scenario for your family. The good thing about time, is that it makes a lot of things better. As you grow older and wealthier, your financial mistakes become a smaller percentage of your overall wealth. I’m only buying rental properties at this point. I can’t finance using conforming loans (too many under current rules), so I will have to pay cash or use non-conforming paper which is more expensive and riskier. Right now, property prices in every market that interests me are much too high to consider buying rentals. Therefore, I’m accumulating a lot of cash in the same kind of places you are with no specific plan to buy. If this continues, I will probably start paying off the remaining existing rental mortgages as the most reasonable use of the cash. We’re moving into a house very soon, but we don’t have to worry about the down payment. It’s our rental home! I like the charts and agree with them mostly. However, if I’m buying a house in the next 12 months, I’d strongly prefer to have the fund in cash. What if you find the perfect house and need to submit a check? It takes time to sell stocks and the timing might not be right. I guess my risk tolerance is lower these days. Also, I don’t think the stock market is going to do too well this year. Good luck with the house hunt. Honolulu sounds perfect for your family. I have no problem holding 100% in cash for a House Fund if the purchase is within the next 12 months, especially with money market rates over 2% now. If you have some stock or bonds, they can easily be sold with cash transferred in 3 business days. Average house takes 30-60 days to close in a good markets.